Want to recruit volunteers for your church or non-profit? No matter where you may be in your leadership, recruiting volunteers can be one of the most difficult tasks you will encounter. Even if you are able to teach a room full of kids, design a website, or manage hundreds of youth, recruiting may not come easy. This FREE, easy-to-read electronic book (”eBook”) provides a simple approach to recruiting more volunteers for your church ministry or non-profit. Whether you are a new leader or have been leading for years, there is something new and fresh to learn about recruiting volunteers. This book is designed to open your eyes to new ways of thinking about recruiting. It will provide some ideas, inspiration, and a 5-step process that will help you to improve your ability to recruit new volunteers for your town. Click here to get your FREE copy of this ebook now! Before you can recruit new volunteers, you need to prepare the way through your actions, attitude, requirements, and prayer. Learn how to create job descriptions, put time limits into your team structure, and develop a contagious attitude that will help you recruit more effectively. Finding new volunteers is often the largest source of frustration for team leaders. In this step, weâ€™ll find fresh ways of thinking for more effective volunteer recruiting. You’ll learn how to recruit by focusing on passion and relationships, becoming others-focused, finding connectors within your church, and recruiting through structure and one-time service opportunities. Donâ€™t skip the interview step! This step is essential to make sure both the candidate and the leader are comfortable to work together. You’ll discover how to conduct a simple, relaxing interview as well as when to include gift and personality tests. The volunteerâ€™s first impression is what will shape their view of your team for weeks and months to come. Your first priority is to get them trained and integrated into the team. Find out how to pick the right person to train your new volunteers, how to conduct a follow-up interview, and how to deal with volunteers that just aren’t a good fit. Recruiting doesnâ€™t end with training. Recruiting is an ongoing process that requires you to learn how to retain your volunteers after you find them. Find ways to reward your volunteers and how to deal with letting go of volunteers when the time comes. Learn how to create example job descriptions, training materials, and more! 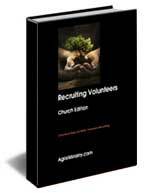 This free book also includes a 5-step action plan for applying this simple volunteer recruiting process. View examples of job descriptions, create simple training materials to help your new volunteers, and create a recruiting plan to guide you through your recruiting process.